This is a newly built five bedroomed detached property which agents Carter Jonas say has been built to very high specification. 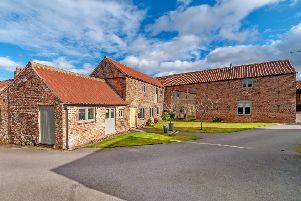 The accommodation is arranged over two floors and includes a reception hall, cloakroom, sitting room, open plan living kitchen and a utility room. On the first floor is a landing, principal bedroom with en suite shower room, guest bedroom with en suite shower room, two additional double bedrooms (one en suite), study/bedroom five and a house bathroom. Contact: Carter Jonas 01423 523423.